Our unique Ultra Mini Triathlon evevnt offers three tracks of participation: athlete/team triathlon, novice/family triathlon, and a 5K Run/Walk. The 5K Run/Walk is held on the same day as the triathlons but runs at its own time using the 5K run course for the triathlons. This option provides opportunity for all athletes to support FNMS. The novice/family distance is set up for families, beginners, teams, supporters of Saul and FNMS, and those wanting to say they completed a triathlon. The athlete/team distance is set up for those wanting a more challenging opportunity, supporters of Saul and FNMS. Racers begin in a heated pool completing 1/8 mile or 1/4 mile swim. Next, racers move to the 3 mile or 20k bike ride around the Marathon City greater area and finish with a 1/2 mile or 5K run. Money raised goes the Foundation for Nager and Miller Syndromes. 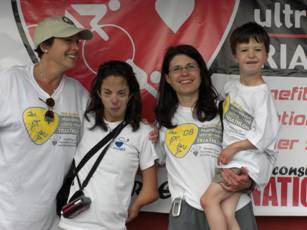 Saul Beranek, a Marathon City 13 year old, is the inspiration for this event and has Nager Syndrome. Complete Registration Online at Active.Com Just Click the Red Button to the right to get started. Athlete Division Triathlon-Course Map-Swim 1/4 mile, Bike 20 K, Run 5K-Race begins at 7:30 AM, Check-in begins at 6:30. 5K Run/Walk uses the same run course as the Athlete Division. Race begins at 8:00 AM and check-in begins at 7:15. Map to Veterans Park-both Triathlon and 5K. Use this link to see a google map street view of the event location.